First you need to sort the items out by date or time if noted on the item, then by importance of immediate or later – some time in the future! Here is what I have found to be very helpful. 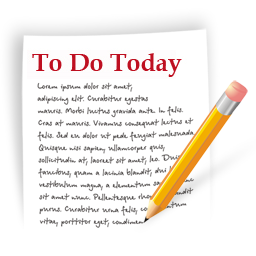 Definition of To Do Now – any item that requires your immediate attention. The goal is to complete it now before moving onto another project. Place similar items together in order, for example: phone calls, bills due within the next 3 days, emails/correspondence are a few examples. Review your priority bundles – you might find you can move a few of these to the To Do Later list. Set your time to complete the tasks and do not allow yourself to get distracted. Set a goal that you will reward yourself with a movie, a nap or just some quiet time once the tasks are completed. You will find you actually feel lighter in “weight” as the tasks are completed and you are free to move on to a new adventure! Definition of To Do Later – any time that does not require your immediate attention or you will be unable to accomplish on this day. Once again, sort out your lists by tasks. Prioritize the task and put an ending date of when it is due to be completed. I call this my “DDD” or drop dead date! When prioritizing the item give yourself enough time to get the task completed. Don’t put down an unrealistic date. Schedule the item onto a calendar white board or calendar of choice and mark them off when completed. Remember to reward yourself for a job well done. As I continue to get my life in order, I find I have more time for friends and self. I use to put everything on a pile and ignore the pile as it got bigger and bigger. Now I just get it done and then move onto peace and happiness and less stress. Please let me know if there are other organizing tips we should be reviewing! Join our Face book to stay informed with all the ways Print & Copy Factory can assist in ‘making a difference’ in your life! You can reach PCF at the following websites: www.printcopyfactory.com; www.pcfwebsolutions.com and www.blog.pcfwebsolutions.com. Are you stressed out, not making meetings at the right time, can’t remember where you left your keys or coat or homework? You need to take a moment and read these tips and get your life in order. You will be surprised how “free” this makes you. You find yourself on time, all items accounted for and the super star for the day.